One of the stalwart stocks of the past couple of years is Dollar Tree. An argument can be made that DLTR is an inflation "canary in the coal mine". If most things get more expensive, and everything at the Dollar Tree stores stays the same price, it's more attractive to consumers. 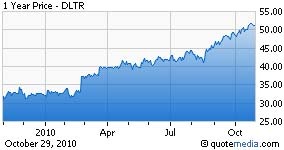 Is DLTR's price action warning of inflation? Similarly, Coinstar's stock has been on fire lately. The argument for it being an inflation canary is much weaker. More money sloshing around means more loose change, and more worthless change? My current thoughts about the endgame of our financial woes is hyperinflation in terms of dollars, but I'm expecting it well into the future (3-5 years).